Chances are if you’re reading this it is because either you or your child struggle with reading. Having a family history of dyslexia and being a struggling reader myself as a child, I know personally how disheartening and how much confidence plummets when one can’t do what everyone else seems to be doing with such ease. The struggling reader feels ashamed, isolated, defective and all to often—they feel stupid. For children, it is a shame that they carry around like a scarlet letter. For adults, it is often a ‘dark secret’ that only their closest friends and family know about. This is why I am so excited about the Cellfield Reading Program. As an elementary school teacher, I have seen some great reading programs, but so many of them still fail struggling readers. When I saw the undeniable results of the Cellfield Reading Program I knew I had to become a certified Cellfield Reading Provider. Cellfield is unlike any reading program available because it is the only reading program which literally rewires the dyslexic brain by creating new neural connections that are responsible for proper reading. It is based on the principles of brain plasticity (the capacity of the brain to change when stimulated in the right way). This includes comprehension and also enhances the major sensory functions that are critical to reading. Brain imaging research shows that poor readers have fewer reading brain circuits and in the wrong places. This makes reading laborious and too slow for good comprehension. 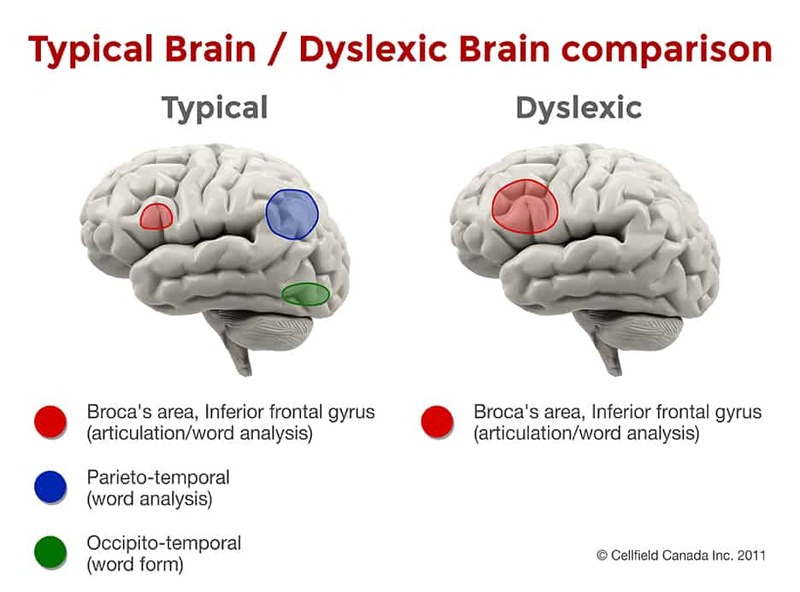 The problem is that regular remedial reading programs might work for a person who needs a little more re-enforcement in reading as opposed to dyslexia in which the individual reads from an entirely different area of the brain. A brain plasticity program is therefore required to shape neurological changes so that the reader is no longer reading from Broca’s area of the brain and instead reading from the Parieto-Temporal and Occipito-Temporal area. Brain imaging has shown that typical readers use the left side of their brains in an interconnected and highly efficient way, whereas poor readers use both sides of their brains in a disconnected and inefficient way. Cellfield is a scientific brain plasticity based intervention conducted over three months which uses a combination of moving graphics, sound parcels and coloured and patched lenses. Cellfield synchronizes information directly where it is needed, training the brain to use more efficient pathways while freeing up working memory so that laborious reading can become more automatized and effortless. Cellfield enables reading to become more automatic, increasing both fluency and comprehension. Cellfield delivers results in just weeks. Cellfield participants on average improve ONE to TWO years in reading skills in just 14 days. There is no other reading program which can consistently who the same results in such a short time. Synchronizes data arriving at the left hemisphere – The simultaneous orthographic/auditory, semantic and motor function shift the right hemisphere activity to the left hemisphere activity where the language centers are found. Research on the Cellfield Program has found a high applicability for individuals ages 6 and up with reading difficulties. By grade 3 children are usually expected to be reading to learn, rather than learning to read, but reading remains difficult for up to 30% of people. Their reading age has reached a plateau and they fall further behind their peers each year. They have been diagnosed with dyslexia or a learning disorder. They have difficulty carrying out oral instructions. They have poor reading, spelling or writing skills. They have good reading skills but can’t recall what they read. Their reading skills are normal but they feel discomfort or suffer from fatigue when reading. They have poor working memory. They feel uncomfortable looking at black letters on white paper, or white letters on a blackboard. They have eye movement control problems.